Ok so, its been a few years since I posted here, I have been posting to our Scout Troop blog, facebook, you tube etc. Here is a vid I did on converting my Hennessy Explorer UL hammock to whoopie sling suspension. Better instructions and videos are available over at hammock forums. But it is fun doing the editing etc. With all the lights and glitter, let us not forget.. HE is the reason for the season. God Bless you and keep you safe, this holiday season. Got down to Red River Gorge in KY.
Got a bit cold, so I threw an extra sleeping bag over the top quilt, not too bad into the 30s. We did some hike and repelling, more pictures on the slide show. Our Boy Scout Troop and Venture Crew had a great time at camp. First year that I can remember that we had zero rain. 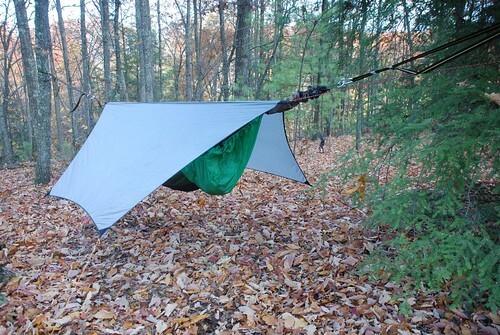 I used my Hennessy Hammock with the zipper mod and JRB Nest under-quilt. I had a Speer (Mountain Crossings) Frog Sac lightweight sleeping bag, but most nights just covered up with a surplus poncho liner. Five nights in a hammock is pure heaven compared to tent. The camp provides canvas tents and cots. Most of the Scouts just dragged the cots out and slept under the stars. I did bring two extra hammocks to demonstrate. 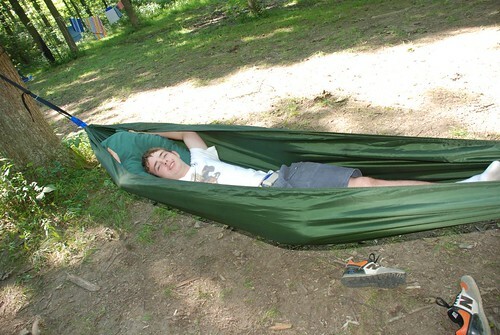 A Claytor NoNet and a Speer Hammock. Both are simple comfortable hammocks and several Scouts and adults snoozed in them during the day and a couple boys spent nights in them. I should have the troop converted to hanging by next year. During the day, the Scouts worked on merit badge activities, swam, canoed, shooting sports, archery etc. The camp provided most meals, we elected to have a couple of troop nights and cooked dutch oven meals at our campsite. One of the features at this camp is a frontiersman program that focuses on primitive skills including flint/steel and bow drill fire making, lashing project, wild edibles, tomahawk throwing etc. Scouts that complete several challenges are permitted to attend a "Rendezvous". First time attendees become 'Pioneers', Second Level is 'Trapper'. A few Trappers that have demonstrated exceptional skills etc are nominated to a 'Mountain Man' honor. Really a fun program, many alumni and especially Mountain Men come back and spend a night on the vous. Many dress appropriatley in The breechclout, buckskins, powder backs etc. Good outlet for Scouts that may have completed many of the merit badges offered. I got my pioneer claw last year, stayed in camp with my troop and allowed others to go this year. Hope to get Trapper next year Grrrrr. Well, this weekend, the Scout troop is off to summer camp. I have to work Sunday and Monday, but will head down after work on Monday. My son has been working on staff there for the last 3.5 weeks. I usually stay in the Scoutmaster tent, but as I was not sure if I was going to make it at all, I passed the duties to one of the other leaders. I will be taking one of my hammocks to use and maybe the other two to demo. 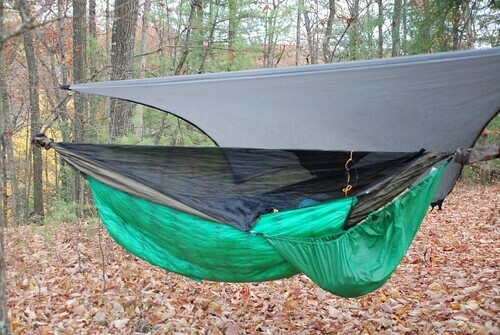 I may get some hammock converts. This is 'camp' camping so meals are provided, but I will still bring a stove or two for coffee if nothing else. Stay tuned for pictures and a report of hammock hanging for 5 nights straight.